Many of today's scanners have the ability to write the full Dynamic Range (HDR - High Dynamic Range) of its hardware into TIFF data. This makes the reduction to 24-bit RGB files obsolete. The ability to save these 'RAW' files opens up an entirely new workflow. The images can be scanned and archived into digital format, and then opened at a later date without any loss in quality. In order to save RAW data with extended Dynamic Range, the 48-bit TIFF format was developed. Scanners with only 30- or 36-bit capability generate maximum output into this format. Regardless of the effective Dynamic Range supplied, the file will always become a 48-bit file. Normal scanning software saves images into a 24-bit files, discarding the extra information created by the scanner whereas 48-bit files retain all of the information supplied. SilverFast HDR enables the user to read and process 48-bit RAW files without being connected to a scanner. In HDR, all SilverFast tools are available: defining Output Size & Resolution, Auto-Adjust of Highlight/Shadow, Three-Part Histogram, Gradation Curves, Selective Color Correction, Unsharp Masking, Color Cast Removal slider, Color Separation, CMYK Preview and more. A sample can be scanned and given back to the customer immediately. Final output processing is not required at this time, the image only has to be saved. Precious samples can be scanned without any loss in quality. The raw scan can be performed by any person (without any knowledge of scanning) - it is only required that the user set the scan resolution. Since the raw scan is now saved in HDR format, it can be transmitted over the internet in this raw form, opening up new dimensions for workflow! Since SilverFast HDR never drives the scanner directly, it can be used with RAW data files produced from scanners that SilverFast doesn't normally support. Simply scan the file with no correction using the original scan software, and then pass the resulting TIFF file to SilverFast HDR. Now you will have all of SilverFast's tools at your disposal! The HDRi feature is part of any SilverFast HDR and Archive Suite edition version 6.6.1 or later. The 64-bit HDRi color files (and the 32-bit grayscale files, respectively) developed therefore contain all readable image information including the information of the infrared channel, the data from which can be used for image optimization (e.g. dust and scratch removal). Hence, HDRi RAW data is the perfect source material for any later post-processing steps. Read more about SilverFast HDRi. 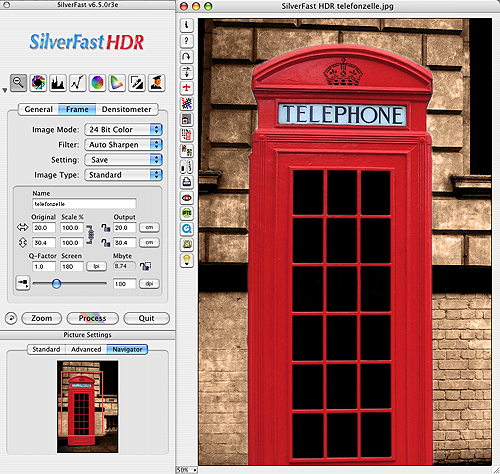 SilverFast HDR can be used with Adobe Photoshop, TWAIN compliant applications, or the SilverFast standalone application. SilverFast HDR 6 has the JobManager included in the standard version now. This is a $500 value and adds unprecedented productivity to SilverFast HDR! With HiRePP and all the highlights of the new SilverFast HDR 6, the user gets a unique and powerful product. Starting with version 5.5.2 SilverFast is able to provide 48-bit fully color-corrected output: (RGB and LAB in 48 bits, CMYK in 64 bits).